The resistance was real on Episode 003. I got 000-002 DONESKIS, then put allllll this pressure on little ol’ 003. “This has to be symbolic and foreshadow allll the future solo shows I’m gonna do for this podcast, blah blah” >> BULLHONKY. I finally released myself from that pressure and gave myself permission to just GO with what came up. “What came up” was a simple decision to listen to episode ONE of Liz Gilbert’s (amazing) Magic Lessons podcast on my way home from the beach with B-man. BOOM. 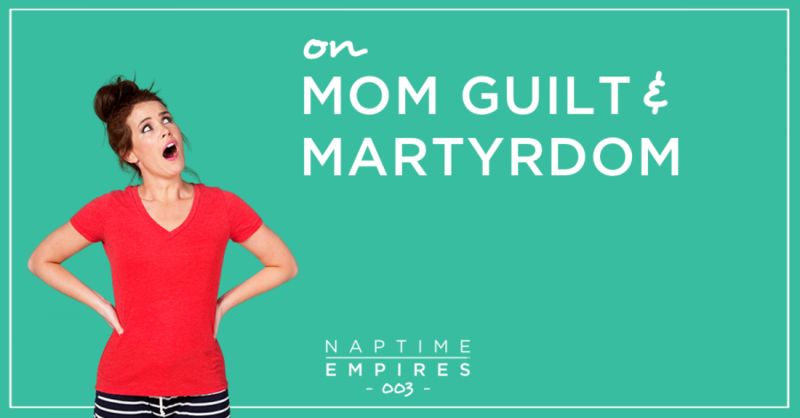 There’s the discussion for 003: Mom guilt and martyrdom. We all want to do – be – have – give more. My first thought? We need to lower the freakin’ bar, ladies. There’s no sneaky secret here. There’s no five-step system for building an awesome Naptime Empire™. I don’t have a shortcut, or think it’s easy breezy – but I DO know it’s worth exploring. Let’s take a vow to remind each other that even on the days when we feel like the WORST moms in the world, quite honestly – we’re doing just fine. – Getting clear on how you want to FEEL as a mom – wife – biz owner – WOMAN.